After being stuck inside all day, with OK weather outside, I took a stroll after work at a place called Kennedy Park, found on the coastline of the North Shore. As I got out of the car it started spitting rain, and the last of the days light slowly began to retreat. Walking through the park, on the cliffs edge, I sank up to my ankles in mud – it was pretty boggy. Following the coastal path I ventured down a long set of stairs to the beach below. 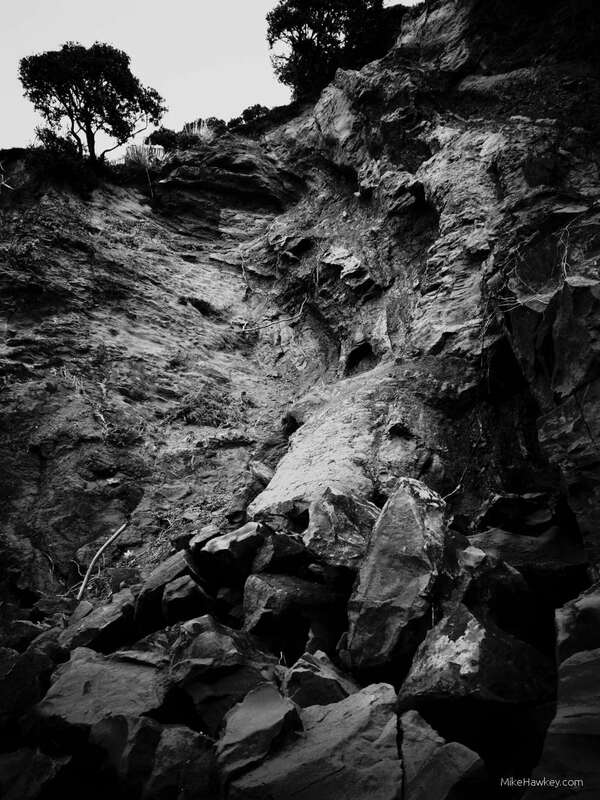 To no surprise, the sodden land had given away in places, and I caught this image of one of the land slips. Its not a totally unusual occurrence along the coastline, and as the multi-million dollar houses remove their trees for a greater view, the cliffs seem to give way more and more with nothing to hold them up. Even areas with trees will eventually give as the wild weather of mother nature washes away the mostly muddy sandstone cliffs of the area. Initially shot in bleach bi-pass mode on the camera, I reduced in size and switched to Black & White in post production in Gimp. I think it gives the image a bit more dramatic depth.